Within the cataclysmic swirl of the Near East's history Empires have risen and fell, faiths and cultures have seen flowerings and descents into sin and desolace, and entire peoples have been swallowed up by others or cast into the wind. Deserts spread, fertility was granted by the grace of irrigation or blessed climate change, with only the distant heavens and stoic mountains possessing of that transient quality of eternity./n/nSentinels to that virtue of savage continuity, rugged endurance have stood long beyond civilized memory and stretch back far in the oral traditions of their countrymen. Hillmen who know only the lightest of touches from foreign yoke - casting off the bane and boon of domestication with a wild animal's ferocity. They do not live in savagrey, but a rugged civilization etched from raw mountain stone and not rotted wood or soiled clay; building kingdoms to stand eye to eye with the great empires that come and go. Some have seen success, the Kingdoms of Armenia and Georgia standing as strong as any lowlands nation ever has, yet others struggle in division and tribal conflict: Their sovereignty shall linger past the rise and fall of kingdoms, but shall be consigned to be as distant stars in the night and hold not the ephermal ambition to challenge the sun./n/nThe Kurds are one such people, their brilliance of martial spirit and endurance shattered and spread across the Middle East. Serving as mercenaries from Ghazni to Egypt, petty warlords possessing transient holdings under the thumb of greater empires, such a diaspora comes like sparks from the fires of their power's ascent following the conquests of Islam. Complacent with pastoral transhumance and mercenary service since earliest antiquity, they had served as soldiers and rebellious headache for the full gambuit of Near Eastern Dynasties, from Babylonian to Caliphate and Seljuk dominion. Yet only in contemporary times have they tasted the fruits of sovereignity as pockets of Kurdish states rose through the cracks of the House of Islam./n/nMost flowerings were brief, weedy things, yet in the West amongst the fertile Nile Delta has a brother of Kurdistan come to rule a Kingdom to be like the Empires they saw rise and fall from the mountain's top. Salahuddin Ayyubi, Sultan of Egypt and patriarch of a Kurdish Dynasty, has not forgotten his roots and hires Kurds second only to Turks as soldiers. Any ruler would be remiss not to, the fame of the Kurds as swordsmen, archers and heavy cavalry well revered by the powers-that-be. 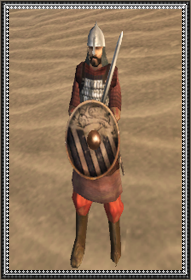 Those that cannot afford a horse but do possess the wealth to set themselves apart from common skirmishers fight as mobile infantrymen, sturdy enough for the battle line or siege but nimble in medium armor to fight dexteriously in the roughest of terrain. For after all it was not a martial glory reserved only for the aristocracy which saw the Kurdish people endure through the centuries.